KUALA LUMPUR: A formal committee, comprising representatives from the federal and state governments, has been proposed to revisit the 18-Point Agreement for Sarawak during the formation of Malaysia. Housing Minister Datuk Amar Abang Johari Tun Openg said the proposed committee would study what had been agreed under the Malaysian Agreement signed in July 1963. “Sarawak’s rights are enshrined and embedded in the Malaysian Constitution and Sarawak Constitution. So we must be united while Malaysia must be strong, and Sarawak must be strong. “For that, the bonds between Malaysia and Sarawak must be strong,” he said at the Lan Berambeh Anak Sarawak 2015 Forum attended by thousands of Sarawakians at the Putra World Trade Centre (PWTC) yesterday. Abang Johari pointed out that the 18-Point Agreement was based on the Nine Cardinal Principles of the Rule of the Rajah — that Sarawak was an independent state ruled by locals. “This was agreed upon among North Borneo, Sarawak, Singapore and the Federation of Malaya before the Malaysian Agreement was signed on July 9, 1963 in London,” he said. Abang Johari said Sarawak wants a return of autonomy in certain areas, citing Article 95 of the Malaysian Constitution, as well as autonomy in taxation. He appealed to Sarawakians or ‘Anak Sarawak’ to read the books ‘Southeast Asia and the Great Powers (Routledge Studies in the Modern History of Asia)’ by Nicholas Tarling and ‘Asia Cauldron’ by Robert D Kaplan to understand the challenges Sarawak had faced and still faces in the region. A section of the thousands of Sarawakians at the forum. 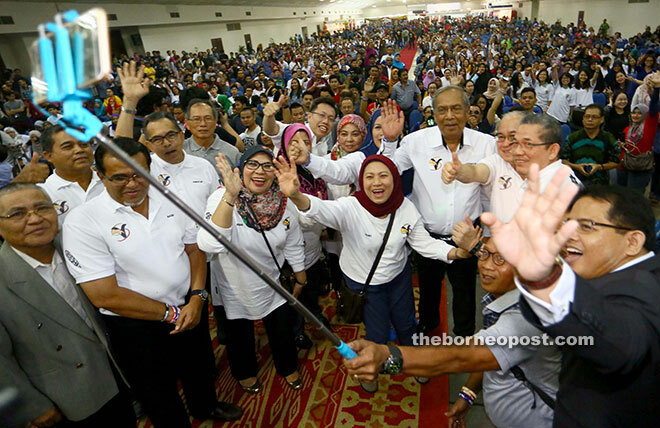 “I believe Anak Sarawak will continue to work hard for a bright future for not just the state of Sarawak but Malaysia as a whole, and be respected by all,” he said. Assistant Minister of Youth Development (Urban Areas) Datuk Abdul Karim Rahman Hamzah said Sarawakians must dig deeper into the history of their state in order to defend their rights. He cited former deputy chief minister, the late Datuk Amar James Wong, who was one of the negotiators for the formation of Malaysia, who wrote in the introduction of ‘The Birth of Malaysia’: “We did not enter Malaysia, but we formed Malaysia together with North Borneo, Singapore and Malaya”. “This is very important. 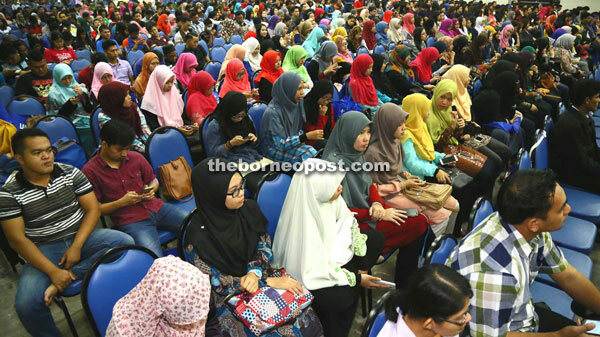 Even our paramount chief of the Iban Tun Jugah has said that Malaysia should not be like the sugar cane, that is sweet at the beginning and getting less and less sweet in the end,” said Abdul Karim. He pointed out that history had shown Sarawak needed to form Malaysia with the other states due to the influence and threats of communism then. Among the factors for the formation of Malaysia were economy sharing, to defend the Bumiputera communities in Sabah and Sarawak as well as to uphold Bumiputera rights, he added. He asserted that there was no need for Sarawakians to talk about leaving Malaysia, although he conceded there is a need to deliberate on whether Sarawak has been given a fair share in the federation. He explained that there is the Federal List, Sarawak List and Concurrent List as far as powers and autonomy of federal and state governments are concerned. Among those included under the Sarawak List are land rights, agriculture, forests, local government, state holidays, water supply and resources, library and museum. “As years go by, new leaders come in and some may not have made an effort to learn all the rights that we have and whether they are still available. “This is our rising concern, and not just talk about withdrawing from Malaysia. We want the powers that are ours and we must to propagate it in the right way,” he stressed. He said a proper avenue must be provided for Sarawak to discuss what the state was unhappy with together with the federal government. Even though Putrajaya had said Parliament was the platform, Abdul Karim asserted that members of parliament do not represent their states. “They represent their constituencies. And there are still a lot of grouses. Tensions have to be kept in check,” he said.